Cat's Walks: A nation of servants? It's true that there are a lot of Filipino maids in Hongkong, so what? What the writer do not realize is that if all the Filipino maids in Hongkong would go on strike, the whole Hongkong economy would be paralyzed. Also, if he knows how to interpret maps, he would then see that the Spratly Islands are very very far from China. His Filipino domestic assistant did right by her degree of International Politics because if I was in her place, the writer would not have been able to write the article above. The fact is, not everything in the South China Sea belongs to China. I'd rather have my country as a nation of servants rather than have it as a nation of cheaters (i.e., China). Hi there cat! welcome back! i would like to share with you and your readers this article by Conrado de Quiros. Very informative and also an eye-opener. What can you expect from a country that invaded Tibet without shame!? Do you really think that Spratly Islands would be an issue for a country like China? They will just take these islands and do not care about the international opinion. 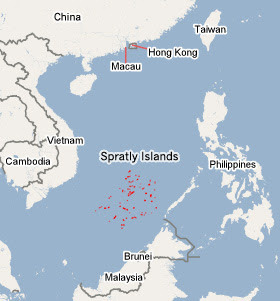 In my opinion Spratly Islands should be shared between the Philippines, Malaysia, and Vietnam. Just look at the map! Do Chinese people know how to read maps?